Banjo players just love to play haunting, lonesome tunes, often called modal tunes, that sound like something that’s just emerged from some deep Appalachian mountain holler. Old-time musicians have come up with a tuning that’s perfect for capturing the special quality of these songs. 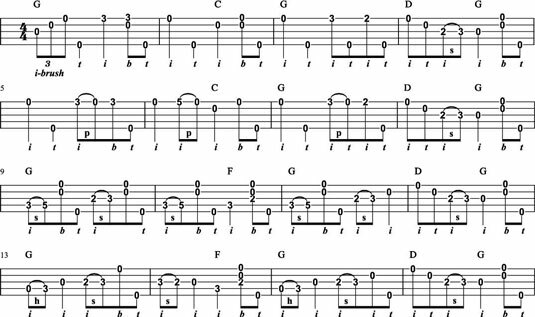 In preparation for playing the clawhammer classic “Cluck Old Hen,” you need to get your banjo into modal tuning. If your banjo is already in G tuning, you only have to retune the 2nd string, raising the pitch one fret from a B to a C, to put your banjo into modal tuning. If your banjo happens to be in double C tuning, your 2nd string is already tuned to a C pitch. In this case, simply raise your 4th string two frets from a C to a D. Your other strings are already in tune and ready to go! “Cluck Old Hen,” shown here, begins with something new: a downward right-hand index finger brush across the top three strings of your banjo, immediately followed by the thumb playing the 5th string. This technique is often called “The Galax Lick,” after the small southwest Virginia town that hosts one of the oldest old-time music conventions in the world. The key to playing the Galax lick is to move across the 3rd, 2nd, and 1st strings in an even rhythm as you play the right-hand-index brush stroke. Check out the audio track “Cluck Old Hen” in Modal Tuning and the video clip Clawhammer Banjo: Modal Tuning and “Cluck Old Hen” to hear how this technique should sound. After you get the hang of this technique, you’ll find uses for it in many other tunes.